England's Bath Bus Company began shuttling customers from the city of Bath to Bristol Airport 19 miles away on Thursday, using a 40-seat bus that is powered by human waste and food scraps. The bus is the first of its kind in the U.K. and can run up to 300 kilometers (186 miles) on a tank. "GENeco's Bio-Bus is an excellent demonstration of biomethane's unique benefits; decarbonising areas other renewables can't reach. A home generated green gas, biomethane is capable of replacing around 10% of the UKs domestic gas needs and is currently the only renewable fuel available for HGVs. 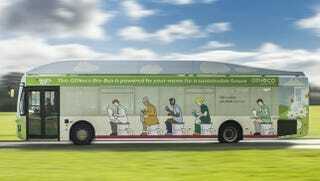 "The bus also clearly shows that human poo and our waste food are valuable resources. Food which is unsuitable for human consumption should be separately collected and recycled through anaerobic digestion into green gas and biofertilisers, not wasted in landfill sites or incinerators. The Bio-Bus will also help to demonstrate the true value of separate food waste collections, which are now obligatory in all other regions, to the English government." The treatment plant in Bristol generates 17 million cubic metres of BioMethane annually — enough to power 8,300 homes. In 2015, the city of Bristol is set to become the European Green Capital, serving as an example of sustainable use of modern energy methods and turning the heads of the strongly traditional lawmakers in London. The benefits of running vehicles off BioMethane include the fact that it's a sustainable fuel, in other words, people will never stop pooping. In addition, it reduces dependence upon traditional fossil fuels. Up to 10,000 passengers are expected to travel aboard the Bio-Bus on the A4 route each month. Unfortunately, the bus does not serve the Number 2 route.